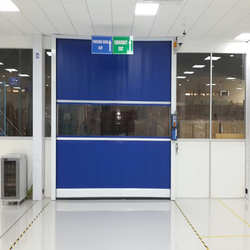 We are a leading Manufacturer of high speed doors in clean rooms and industrial high speed door from New Delhi, India. Achieve maximum environmental control and separation at the door opening with Nice-Automation`s High Speed Doors. The main function of a high speed door is to act as a barrier. High speed doors protect us from harm, save energy and help us to separate processes for optimal productivity. A high speed door's most important job is to simply open and close quickly and safely every time you need it. Nice-Automation`s revolutionary line of high speed doors is designed with these efficiencies in mind to bring your workflow to its high potential. Known for high speed, low maintenance, and maximum uptime, Nice-Automation offer the industry's widest range of solutions to fit your every need. Nice-Automation has a large collection of high performance, high speed door solutions in roll-up and bi-parting designs, available in versatile track configurations. Capable of moving at 100 inches per second, the cycle times of Nice-Automation doors maximize energy savings by minimizing the amount of air that can escape each time the doors open and close. This is a huge benefit in a warehouse space, where damaged doors can mean significant expenses in terms of downtime and service calls, as well as energy loss. Prime High Performance Doors are designed and factory-made with German collaboration using state-of-the-art and resourceful engineering technology for frequent use in high traffic areas with opening speeds up to 3 m/s. The high opening speed reduces time taken in movement of material, thus hastening the logistics process. Our team of skilled engineers visits site and recommend the most suitable rapid door to client. 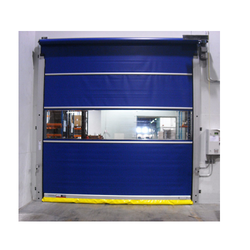 Rapid doors are manufactured and installed keeping in mind international standards. Many manufacturing industries nowadays need a controlled environment in which you limit the amount of dirt and dust in the manufacturing premises. Medical instrument manufacturer, electronics and computer manufacturer, food industry, pharmaceutical industry and some military applications are but a few of the examples that have strict requirements for maintaining dust free environment. High speed doors have become integral part of every industry.